Let the Alexander Wang comparisons begin! NKWON is a Korean-born, New York-based designer who mixes sophistication and urban edginess in a way that very much recalls the CFDA award-winner. Modern shapes, geometric cutouts, infinite wearability - check, check and check. NKWON's designs are a bit more feminine than Mr. Wang's, but they still retain that air of downtown cool. And Wang-like or not, there can never be too many options for achieving this kind of edgy simplicity. 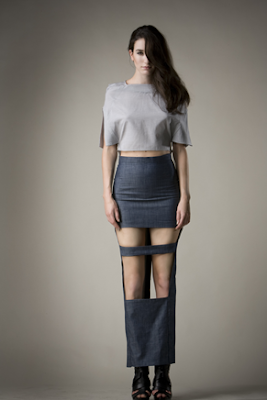 this brand is cool, but seriously, how would you walk in that skirt in the second row? I really love this collection/designer. I do see the Alexander Wang similarities, but I think the clothes are strong enough to make an impression. Oh, and I predict Shopbop will start selling the collection. They've been doing a great job of snagging new designers before they become well-known. there are some really interesting pieces here. ha ha I was thinking exactly what Sami said!!!! But I think it is a creative and interesting line indeed. that's soooo cool you visited my blog and left me a comment! it made me sooo happy! remember you can keep in touch with my blog via blogger, bloglovin, facebook and twitter! i love the unexpected cutouts...that first skirt is gorge.